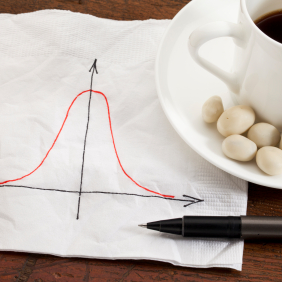 We learn about bell curves (or Gaussian distribution, if you’re a nerd) in school. It’s the time-honored observation that the midrange of any large set is usually the most popular. Most people are of average intelligence, with some outliers at the high end and the low end; most cars are mid-priced; most accidents happen midweek. To a marketing person, the middle of the bell curve is the fat part of the market: the point where the volumes are reasonably high and the prices are reasonably low. That’s where most of the money is to be made, not at the skinny extreme ends of the market distribution. It’s why Toyota is more profitable than Lamborghini or Lotus and Dell is bigger than Cray or Arduino. To an engineer, that’s also where you’re likely to spend most of your development effort. The midrange is where performance is good but not extreme and the costs are moderate but not cut-throat. It’s the happy medium toward which we aim. None of this was lost on the clever minds at Freescale, where they’ve been attacking the fat middle part of the bell curve since before many of us were born. Freescale has been making really good, but not extreme, processors for a long time now. The company has settled into a comfortable niche making intelligent communications controllers that deliver a performance punch without getting all weird on us. It all started with the QUICC, a 68K-based processor that had an awful lot of communications I/O on it. That morphed into the PowerQUICC, the same confection of computer and communications, but with a candy center made of pure PowerPC. That, in turn, mutated to become QorIQ, the current umbrella term for the company’s intelligent networking chips. (There’s also a Qonverge spinoff, but we’ll leave that for now.) Apart from the gratuitous application of the letter Q, there’s not much in common between the early chips and the current ones. QorIQ (pronounced “core-eye-cue”) comes in a lot of different flavors, from small and light to big and beefy. But, true to form, the chips in the middle part of the QorIQ distribution curve are the most popular – and the most profitable. Volumes are good, prices are moderate, and performance is right where engineers need it to be. Padding out the middle of that curve are two new parts, the T1042 and the T2080. If you’re a QorIQ aficionado you know that the initial T means these are second-generation parts (as opposed to the earlier P-series), and that the leading digit gives you a rough idea of performance level. Apart from that, all bets are off. Even Freescale’s official product-naming czar admits that the part numbers are largely arbitrary. There’s just no way to maintain a technically meaningful numbering scheme for more than a few years. The littler part, the T1042, has four PowerPC cores at its heart, each one beating away at 1.4 GHz (you can get slower ones if you want). All of the CPUs are identical, and each one comes with its own pair of L1 caches and a 256KB L2 cache. The only shared cache is a separate 256KB “platform cache” that all four CPUs can reference. The e5500 CPU core design is single-threaded, so you don’t get the benefit of multithreading (more on that later), although you do get all the quad-core goodness. In short, the T1042 has way more horsepower than the last PowerPC-driven Macintosh ever had. And it’s a lot cheaper. The real attraction of the T1042, however, is its rich collection of communications-related peripherals, accelerators, and programmable engines. It’s not often you see a quad-core PowerPC overshadowed by its peripherals, but that’s clearly the case here. Network developers can geek out on the T1042’s specification sheet; we’ll move away to a safe distance. The larger T2080 chip is similar to its sibling in many regards – mostly in the communications complex – but with faster and more capable PowerPC processors. There are still four CPUs, but each one is dual-threaded, which means that it’s almost like having eight CPU cores at your disposal. Some programmers prefer multicore architectures; some prefer multithreading. The T2080 gives you both. The clock speed gets a bump to 1.8 GHz, and the cache structure gets rearranged a bit, but the real change is the T2080’s 64-bittedness. While the e5500 CPU core in T1042 can “switch hit” between 32-bit and 64-bit modes, the T2080’s e6500 CPU core is 64-bit only. That’s what most high-end developers want – why else would you be using an 8-CPU chip? – but it does mean you can’t share your binary code between the two devices. The T1042’s switch-hitting capability allows you to write (and run) either 32-bit PowerPC code or 64-bit code, as you prefer. But chips farther up the food chain, including the new T2080, are 64-bit only. The 64-bit chips also come with the AltiVec extensions, so there are extra registers and instructions at your disposal as well. Since most programmers these days will be using compilers and not writing much assembly-language code, a simple recompile should be all that’s needed to swap from one device to the other. If not, this might be a good time to think about modernizing your software-development tool chain. Regardless of CPU architecture, the communications-related island stays pretty much the same from one QorIQ device to another. And that’s the real power of Freescale’s product line. Anyone can program a PowerPC (or even several of them) to run applications and control-plane code. It takes a real knack to code up the performance-sensitive data-plane stuff. Once you’ve got that in place, you’re not going to want to touch it, and Freescale goes out of its way to preserve all of your efforts. Sockets and clock speeds may change, but the frame managers, security, compression, and regex all stay the same. The two new QorIQ chips aren’t intended to extend the state of the communications-controller art. They don’t even advance the QorIQ product line into new territory. Instead, they backfill the fat part of the bell curve with chips that are about as fast as, but cheaper than, current devices. The new chips are also more power-efficient, thanks to more aggressive silicon manufacturing and a slightly different design focus. Current users of the P4080, for example, may find that the new T2080 delivers the same performance at half the power. Conversely, for P3041 users, the T2080 doubles performance at the same power level. The smaller T1042 offers similar incentives to replace earlier QorIQ parts. That’s what’cha call progress. The new QorIQ chips certainly aren’t for everyone. If you’re not making routers, security appliances, or other ugly networking gear, you won’t be interested at all. But if that’s your métier, these devices should hit the big fat sweet spot of your requirements.